Successfully Added Solar Powered Color Changing Crystal Glass LED Light (Night Light) to your Shopping Cart. Light up your life with the Solar Powered Color Changing Crystal Glass LED Light! Want to jazz up your bedroom? Own a restaurant and want to make a certain area stand out more? Feel like your night club is missing something and want to give it more life? 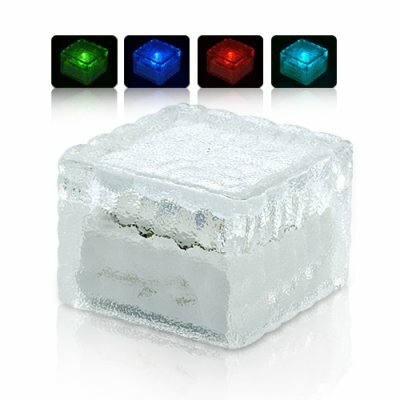 Well here is the answer, the Solar Powered Color Changing Crystal Glass LED Light! This super unique LED gadget comes with an internal solar panel that allows it to be automatically recharged during the day. At night, watch it suddenly come alive with beautiful colors that are constantly changing, adding some much needed ambience to an otherwise dull room/atmosphere. Watch as others are awestruck at the sudden barrage of colorful brilliance. This Solar Powered Color Changing Crystal Glass LED Light is great for any location and can especially be useful to add flavor to your bedroom, clubs, bars, restaurants, hotel rooms, and even during special events. Order today and we'll ship it out to you tomorrow. Brought to you by the leader in LED gadgets and toys, Chinavasion. Can I use this LED gadget in the rain? Yes, light drizzle is completely fine, but please do not submerge it in water.